Paying electric, heating, and cooling bills seems to get more and more difficult each month. There are small ways to save energy (i.e. sustainable light bulbs, wearing sweaters) but these methods won’t make a large difference. What will make a difference is replacing your old windows and doors with new, energy efficient models from Renewal by Andersen®. A shining example of our efficient manufacturing process is our production of Fibrex® material. This composition of wood grains and thermoplastic material is more sustainable than any vinyl or fiber cement material available. And any excess material from one production gets recycled right into the next one. That way we don’t have to dispose of waste materials in landfills like the majority of manufacturers who create vinyl products. We use our Fibrex® material to create doors and windows for Philadelphia area homeowners that keep their costly energy trapped inside their home. 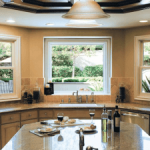 Combine this with our “Low-E” glass, which limits penetration of both UV and IR light, and homeowners get a superior level of energy efficiency from Renewal® products. At Renewal by Andersen® of Greater Philadelphia, we fully support the national mission of Renewal by Andersen® for more sustainable building practices. We work hard to ensure that each project we perform is done with environmentally responsibility at the forefront, which means installing products that save you energy, and limiting our own impact on the environment.